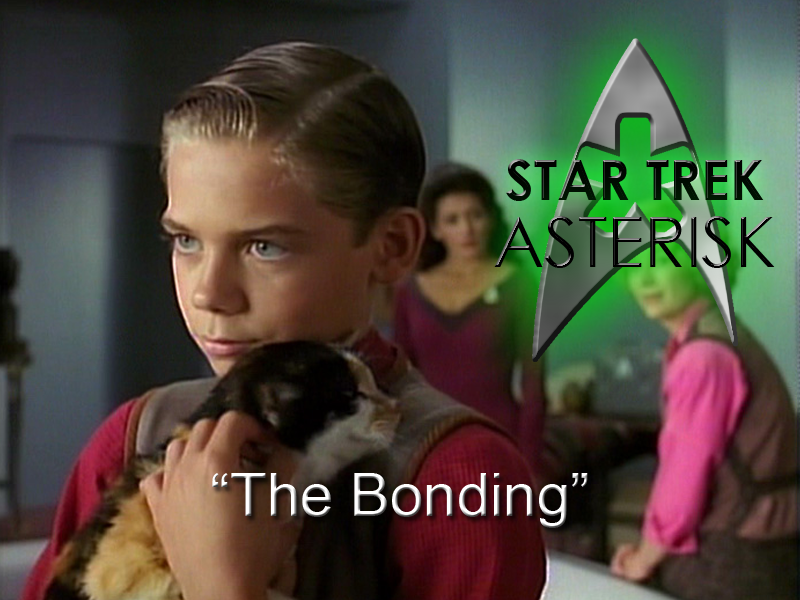 Star Trek: Asterisk "The Bonding"
Worf tries to bond with a kid whose mother died in his away team. And then the mother comes back?! The first image we see of Lt. Marla Aster is of her lying on the floor dead after beaming back from an away mission. The planet was supposed to be uninhabited, but Worf and his team found... something. Something dangerous. But that's not important right now, because Lt. Marla Aster had a son. So, who's gonna go tell the son? Picard and Troi take it upon themselves to assure him that on the starship Enterprise, one is never alone. And in the meantime, Wesley thinks about the death of his father. Wesley Crusher now has something in common with Jeremy Aster. But, wait... he already had something in common with Jeremy Aster... Jeremy's father was already dead and now Jeremy is an orphan whereas Wesley has his mom. Does that seem right to you? In any case, this leaves the opportunity wide open for Data to muse on the very human experience of death. 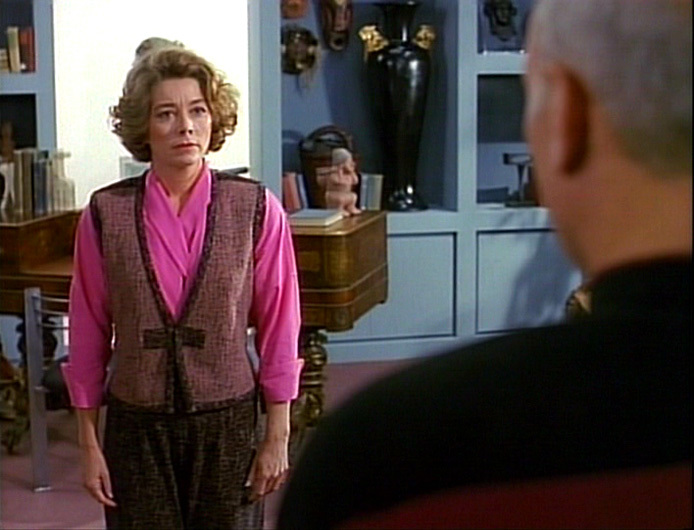 He finds Riker in 10-Forward and asks him how well he knew Marla. Riker admits that he didn't know her very well, and then he asks the same of Data. To which Data responds "why do you ask?" Riker's confused at first because Data asked first, but Data clarifies "why do you ask the question?" He's confused because shouldn't what you feel about the death of someone be the same regardless of how well you know them? Riker admits that perhaps there wouldn't be as many wars in humanity's past if that was true. "So, you're saying Star Wars is inferior?" Wesley gets his contemplation time, too, when he goes to sickbay and Beverly wants him to talk to Jeremy. They start talking about Wesley's father and he admits that sometimes he can't even remember what he looks like. They have a moment and we are reminded that Captain Picard was the one who had to tell him. Picard was the one in charge when Mr. Crusher died. 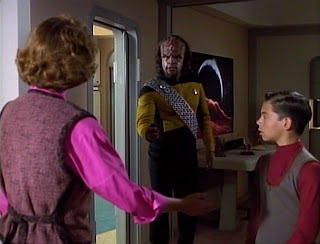 And then there's Worf who is feeling really bad about losing someone under his command. He wants to go through a Klingon bonding ritual with Jeremy, but Troi advises him not to force it. So, anyway, meanwhile, Geordi took an away team to the planet and found that there were leftover mines, but that the rest of the ones had been physically picked up and deactivated somehow. So who did that? 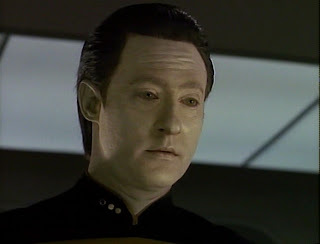 Later, Data picks up an energy buildup on the planet. And then Jeremy is watching home video footage of his mother and then suddenly Marla shows up in his room! She assures him that she is his mother, but then Worf comes along and is not quite as convinced. "You are NOT the mama." Fake Marla tries to make Jeremy come with her back to the planet. She tells him they can live in a home just like they did on earth, so she takes Jeremy to the transporter room. But Picard is having none of that. Fake Marla says she just wants to live happily with Jeremy for the rest of their lives, but as soon as Picard takes Jeremy away by force, Fake Marla disappears. Troi takes Jeremy back to his quarters and suddenly it turns into his home from Earth with his cat and everything and Marla shows up again. Then Geordi comes up with the brilliant idea to block the surge of energy coming from the planet by remodulating the shields. So right in the middle of assuring Jeremy that she'll never leave him, Fake Marla disappears again. That doesn't hold her back for long, though. The energy being flies up from the planet and penetrates the hull. It takes out a couple of officers on its way to Jeremy's quarters and transforms it once more. Picard then tries to reason with Fake Marla who explains that the beings who lived on the planet were split into two races, one energy and one matter.When the matter beings destroyed themselves, the energy beings vowed never to let that war hurt anyone else. And they feel responsible for the leftover mines that killed Marla, so now they just want to help Jeremy. So that's when Wesley comes along and tries to diffuse the situation by empathizing with Jeremy. He admits that for a long time he was mad at Picard for being in charge of the mission that killed his dad. Picard draws the parallel for Jeremy that Worf was in charge of the mission that killed his mother. So Jeremy and Worf share a moment and Worf offers to go through the Klingon bonding ritual with him. With all the feels worked out, the energy being disappears and everything is right with the Enterprise once more. The episode closes with Worf and Jeremy playing with candles in Worf's room. This is a pretty sad episode, but it treats death way better than "Skin of Evil" did. And Marla was just a redshirt. It explores the different angles of death, even drawing on what little we got from the death of Tasha Yar. It's especially important to develop the relationship between Wesley and Picard. Here we learn that Wesley was angry at Picard for a long time, but eventually came to understand and, possibly, even count him as a father figure. A very moving episode all around and one you shouldn't miss.